Normally I don’t like to write about food that was prepared by a catering service company on my blog as one does not get the true overall experience as compared to that of a restaurant, however I decided to go against that notion this time around as the food that was served that day was truly very good and definitely deserved a good mention. Marigolds and Onions has been a reputable catering service company since 1991 and on this day, we had invited them to provide lunch for about 10 of us. As we entered our room, the table was set and there was a set menu place on our plate which a 3-course meal. On this day, they decided to serve us some Organic Baby Greens Salad as an appetizer, Chard Stuff Chicken as an entrée and Reve for dessert. The presentation and the content on the salad were quite magnificent to say the least. There were many interesting pieces that made this salad so dynamic. The vegetable leaves were carefully wrapped with a piece of cucumber. A mixture of smoked paprika and red wine vinaigrette sauce was then used to pour on top of the wrap. 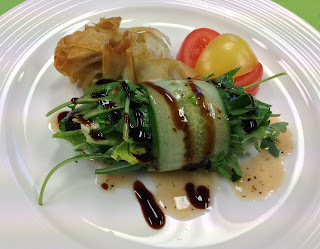 As well, there was a fresh piece of tomato, a small phyllo purse with creamy stilton, buttered leeks and black mission figs that surround the wrap. This truly was an organic dish salad that had all the wonderful ingredients in it. The salad was fresh and with each bite, the brain cells in your head were screaming at you wanting for more. The Chard Stuff Chicken was quite delightful as well. Normally I don’t like stuffed chicken as it makes the meat quite dry however these chefs knew how to put it together to make it a wonderful entrée to have. Inside this piece of chicken was a combination of Swiss chard, artichokes and roasted tomatoes. The combination of these ingredients placed inside of this chicken made the meat exceptionally juicy and made the allowed the meat to maintain its moisture. There was also pepper cream sauce placed on top of the chicken. 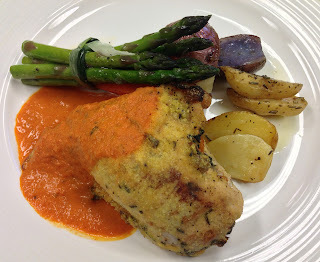 The chicken was surrounded with baby red potatoes, smoked paprika and asparagus. A touch of olive oil was also used to enhance the overall flavour of the dish. At first glance, I thought I would be having dry chicken meat for lunch however I was sadly mistaken as this dish turned out to be an excellent meal to have. The reve dessert was really amazing as well. 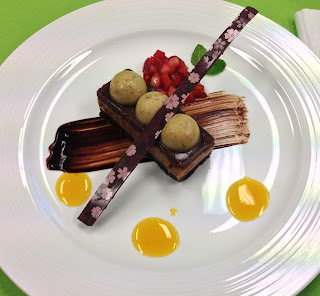 A combination of sweet chocolate crust, almond nougat, milk chocolate ganache with banana bavarois peaks filled whatever space was left in one’s stomach. Although all of the ingredients pointed towards a super sweet dessert, it was actually not too sweet, but it was however sweet enough to satisfy all the sweettooths in the room. Again it was presented in a very chic manner where full marks had to be given for its artistic work in presenting the food to us. Overall, Marigolds and Onions showed they really knew how to put smiles on people’s face with the food that they had served us. I was very impressed with their food, their professionalism and their service. I will certainly give them another shot as their food certainly warrants a second visit. Overall, I give them a 4.5 out of 5.